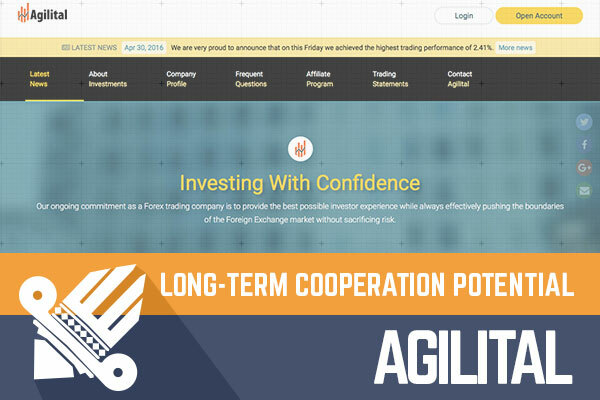 At the end of April to Golden Stage listing joined Agilital with $400 deposit. I must tell now that administrator has done this project at the very exceptional level, and it gives a great first impression. At the moment when I'm writing these lines of the review, the project is online only 16 days, and it is certainly just the beginning of this project. If you want to enter it then now is the time because Agilital offers long-term investment plan with a variable daily revenue. Well, today is the 21st century, but somehow ordinarily HYIPs tend to look like they were done years ago. There is one explanation for that - administrators that are working in this industry began to develop their first HYIPs 5 - 10 years ago and still use the same development and design style. When money comes why there would be a need to invent something new? Sure thing it's hard to adopt a highly volatile web standards, and that is why we see projects that almost always looks almost like some other that we observed some weeks ago. But one thing is clear - Agilital is not a product like that, the project is fully custom made, fully responsive (responsive web design makes web page look good on all devices (desktops, tablets, and phones)) and uses custom features, unlike standard HYIP projects that we have used to meet around. For HYIP to grow enormous, the main aim is to target investors outside regular HYIP investor cycle because HYIP "regulars" know that HYIP will close one day, and they invest with caution. This is not the same story about investors that arrives from outside of regular HYIP investor cycle - such investors invest, reinvest big and does not imagine the project will ever end. Each HYIP can easily attract "regulars" by joining HYIP blogs and monitors, but HYIP that does not look like HYIP can also attract people that are not regular investors. I'm sure you already feel where I'm going with this - Agilital does not look like another HYIP, it offers a relatively small daily return, and all the HYIP business is nicely "covered" with a lot of information and "forex statements" that comes out after each trading day. If I would come from outside of regular HYIP player cycle and visit Agilital web page, I'm sure that I would think that Agilital is something real, and maybe I would even make a spend. As I said, the administrator has developed a project that is entirely custom made. Option where you can add additional funds to your existing deposit I have seen earlier, but to be honest, I have not seen it around for a long time and it is something little bit different than with other projects. If we have touched deposit topic than I must say that it is awkward to see that Agilital accepts only Perfect Money, Bitcoin, and Payeer as deposit option. I hope administrator will try to add also some other payment systems to project that is done at this level because HYIP industry does not end only with these three options. Interesting is a fact that with Payeer you will also be able to deposit with EUR currency. Additionally, I would like to see some additional language localizations, but I hope administrator understand that it just logical step and they will be added in the future. A project that is done at this level, but lacks for example incorporated company and amount of payment processors can mean either administrator is not very professional either administrator only recently has started, and this might be his first or one of the fist HYIPs. I would not want to agree that administrator is unprofessional because developing something so custom and so good takes a lot of expertise and that is why I think that this is one of the first HYIPs for him. Do not get me wrong - that is nothing bad because every administrator once was a beginner and because all depends on the talent and patience (also a little bit on the budget) I think that there is considerably good chance that something good will turn out of this HYIP. In any case, I will remind golden words - if you invest than spend only that you can afford to lose because even the best projects will close one day. Investment plans: 60% up to 90% of investors share of profits, 1.096% up to 1.644% daily for 120 trading days, initial deposit returned at the end of the investment term. I would advise that you pick the highest ranking Forex broker: AvaTrade. Ever considered maximizing your free BTC collections by using a BITCOIN FAUCET ROTATOR?